I am trying to be more of a goal-driven cook. Instead of going through the weeks shopping for and serving up the same handful of dishes — and this is way too easy to do — I’ve been setting seasonal goals in order to push my kitchen skills. My fall challenges have included cooking a pot of beans, starting with the dried version instead of opening the can, and making chicken noodles soup from scratch. I was satisfied with the results of both self-imposed challenges. I accomplished my third fall-food goal over the weekend, when I successfully roasted my very first chicken. I know, it’s been done a million times before, but I’m a one-trick pony who sticks to boneless, skinless chicken breasts. Equipped with a brand-new roasting pan — a thoughtful early birthday present from my boyfriend, Chris — and some tips from some of my favorite cookbooks, I got to work making this bird my own, removing the neck and other treats from the chicken’s cavity, rinsing and drying it and then smearing the area between the skin and the breast meat with herb butter. Roasting a chicken turned out being a challenge within a challenge because I am a very impatient cook. I hate waiting for dishes to become complete, and often create shortcuts — some successful, some not to great — to speed up the process. I had to chill a while the chicken spent more than an hour in the oven. But patience paid off, as the end result was moist and flavorful. Making the herb butter was a fun way to use some of the thyme, rosemary and oregano I’m growing in the back yard, although next time I might use 4-6 tablespoons instead of a whole stick of butter, as it seemed a bit excessive given the size of my chicken. A five-pound bird yielded enough meat for quite the filling dinner Sunday with enough leftovers to make a mean batch of chicken enchiladas. What goals are you setting in the kitchen? Mix butter with a tablespoon each of chopped thyme, rosemary and oregano. Rinse and pat dry chicken. Slide finger under skin of breast to loosen skin. Spread 4 tablespoons butter on breast meat. Place herb sprigs in cavity and tie legs together to hold shape. Place chicken on rack in roasting pan and spread remaining herb butter on skin (depends on how much butter you want on the bird). Toss potato quarters in bowl with salt, olive oil and remaining tablespoon rosemary. Place potatoes in roasting pan with chicken, and place roasting pan in oven. Bake roughly 80 minutes, or until chicken is golden and the thickest part of the thigh makes it to 180 degrees, and remove roasting pan from oven. This is how the restaurant Zuni does it. Ok, it does require that you season the chicken 1 - 2 days before cooking, but you get to cook the chicken at 450 degrees for about only 45 min. Lots faster! Hey, congratulations on the food goals! Concidentally, I've done all those this season, too! Well, I generally make 15-bean soup with dried beans. But I roasted my first chicken (delicious and easy on the grill!) AND we made chicken noodle soup from scratch (Well, the chicken and stock were from scrach. We bought the egg noodles.) I'm ready for some new goals ... you? Erik, thanks for the link. 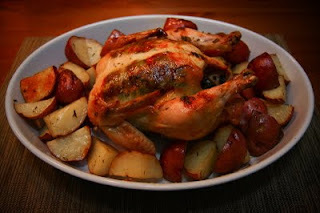 I've heard great things about Zuni Café's roast chicken. Steph, my "scratch" soup also contained store-bought noodles. Oops! New goals include making my own pasta, and cooking with crab. It's too good to not make some seafood at home!